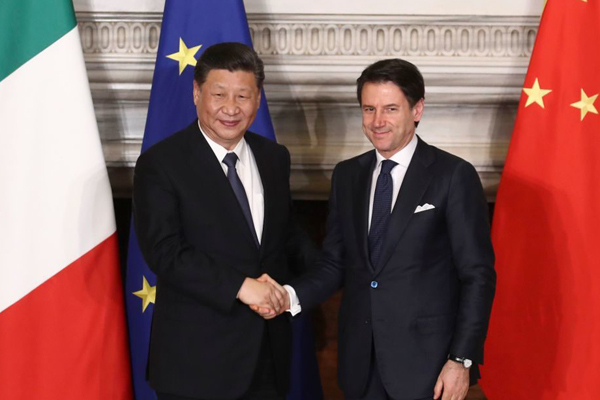 Chinese President Xi Jinping and Italian Prime Minister Giuseppe Conte during a meeting on March 23, 2019 in Rome, Italy. Photo by Sheng Jiapeng/China News Service/VCG via Getty Images. The Italian culture ministry has agreed to oversee the return of some 800 cultural artifacts that were illegally exported from China. The deal made last Friday, March 22, marks the largest number of Chinese objects to be repatriated from any nation in two decades. The landmark move comes amid a strengthening of political ties between the two countries, steered by Italy’s agreement to sign onto China’s controversial “belt and road initiative.” On Friday, the Italian minister for culture Alberto Bonisoli signed the repatriation agreement with his Chinese counterpart Luo Shugang, promising to give back 796 Chinese objects that had been “illegally exported.” It is the biggest return of Chinese artifacts since the UK handed over around 3,000 smuggled objects in 1998. Objects being returned date from as far back as 5,000 years ago to the early 20th century and are suspected to have been stolen from various archeological digs. The trove includes significant items like a Neolithic-era clay pot related to the ancient Majiayao culture, Song dynasty porcelain, and pottery from the Han, Tang, and Ming dynasties. Italy’s Carabinieri Art Squad discovered the trove at a local market in 2007. Following a legal investigation into ownership, a court in Milan finally ordered their repatriation last November. “We are proud to be able to return these pieces to our friends, as they are representative of the heritage and identity of the Chinese people,” Bonisoli said in a statement from the Italian ministry provided to South China Morning Post. The two culture ministers also discussed cooperating on the fight against the trade in illicit cultural artifacts. There are countless stolen or smuggled Chinese objects in countries around the world, and Beijing has ramped up campaigns for their repatriation in recent years. The announcement was made during an official three-day state visit by the Chinese president, Xi Jinping, to Rome. During this visit, some 29 agreements were made between the nations, including preparatory work for Italy to sign on to the controversial “Belt and Road Initiative.” The ambitious investment program would support a network of infrastructure projects connecting Asia, the Middle East, Africa, and Europe. Italy is the first Western European nation to sign onto the initiative in the hopes that it will attract new investment to its sluggish domestic economy. Meanwhile, the country is facing international backlash over the decision from allies in Washington and Brussels, which are worried that China will use the program to exert control over strategically important global assets.